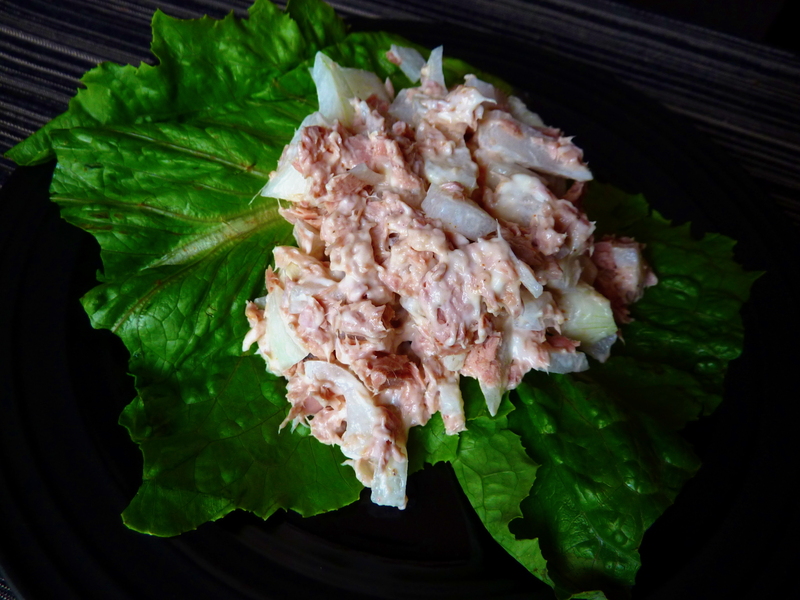 After containing my honeyrock excitement, I whipped up a bowl of canned tuna, onion, and miracle whip. For lunch I had half the can, served on two big romaine leaves. I actually rolled it up and ate it like a taco! What a great idea! I saved ~240 calories by using lettuce instead of two slices of bread, and hardly missed the carbs. 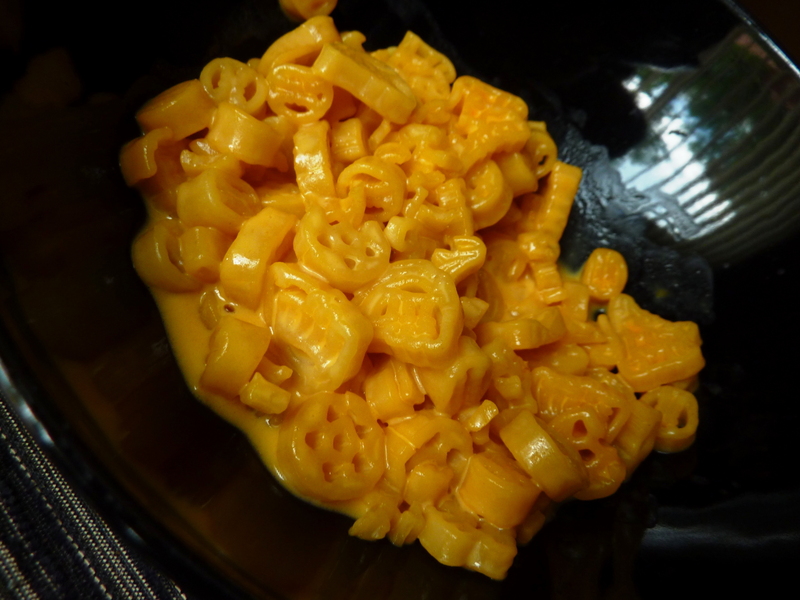 Also made a box of Mac ‘n Cheese. Yup, they are sports shapes. Yup, I am really 24 years old. 🙂 Half the box was enjoyed with the tuna. 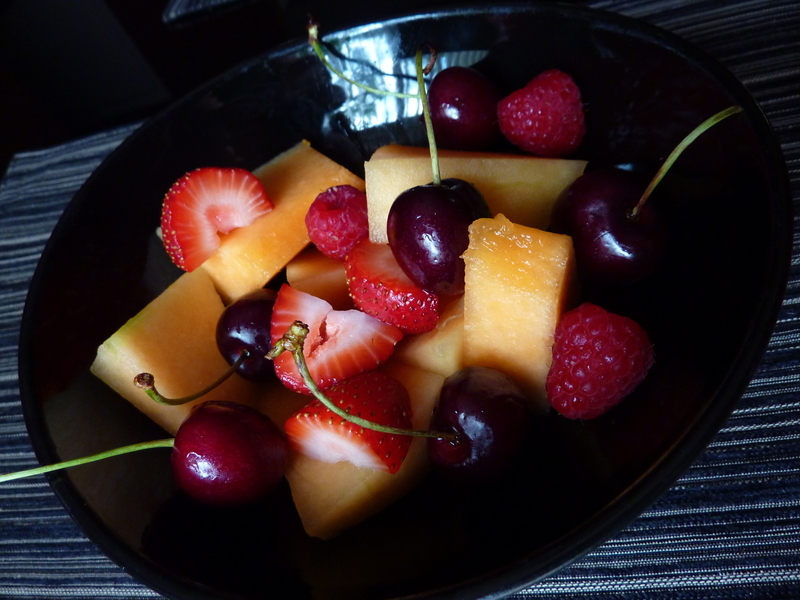 Also, naturally, I had a bowl of melon with berries and oh-so-delicious cherries. While the salmon was marinating in the fridge, I toasted one half of a baguette, sliced into 1/4″ thick pieces. Whatever for..? BRUSCHETTA! 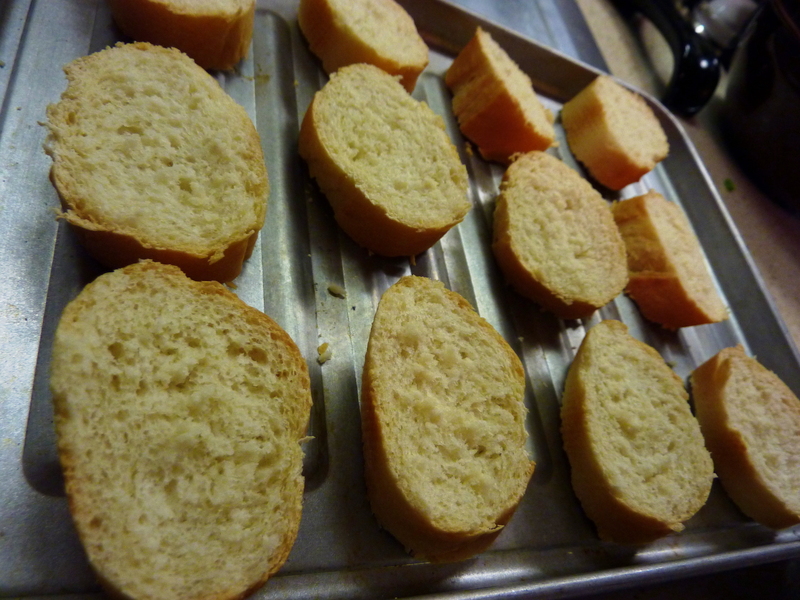 Once these were lightly toasted, I rubbed the toasted baguette slices with a piece of halved garlic. I got the idea to make bruschetta from a recipe featured in the most recent issue of Cooking Light magazine, in which it suggests preparing bruschetta as a side dish for another dish I will be preparing later this week (stay tuned!). 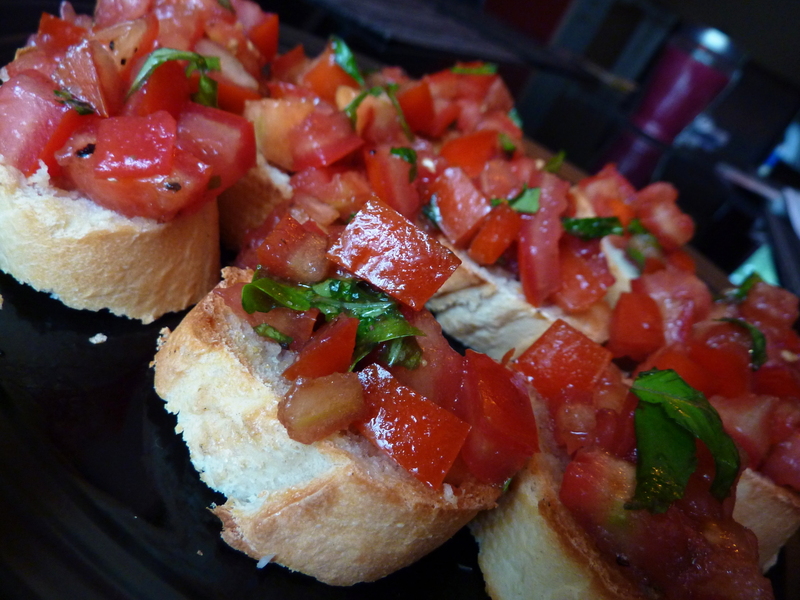 So we shall see bruschetta appearing in my kitchen again soon! My other side dish was from a brainstorming of ways to prepare a few of the oodles of zukes brought to me yesterday, by my parents, from their garden. 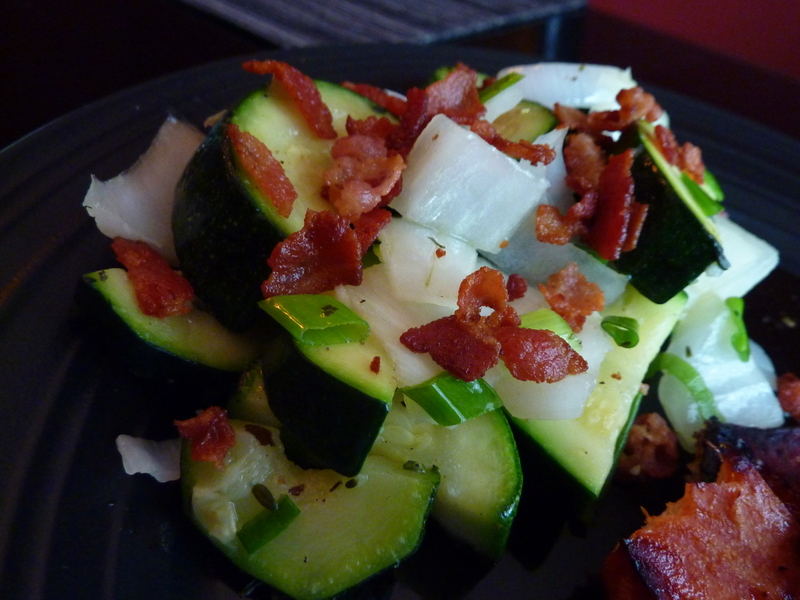 I found an idea online to saute zucchini with bacon, so I made some modifications and came up with the following recipe. First I diced 3 slices of bacon, and cooked until crisp (this step was done by Tom – must give credit where credit is due). Once the bacon was done, it was removed from the pan and drained on paper towel for later use. With the approximately 2 Tbsp. of remaining bacon drippings, two zucchinis were sauteed for around 10 mins (a bit longer than was necessary), along with half of an onion and one clove of garlic. At one point I threw in a handful of chopped green onions as well. I also sprinkled the dish with dried thyme and basil, and S&P. Once the veggies were done, the dish was served with the crumbled bacon on top. Zucchini with bacon! Heck yeah. It’s all about balance, my friend. 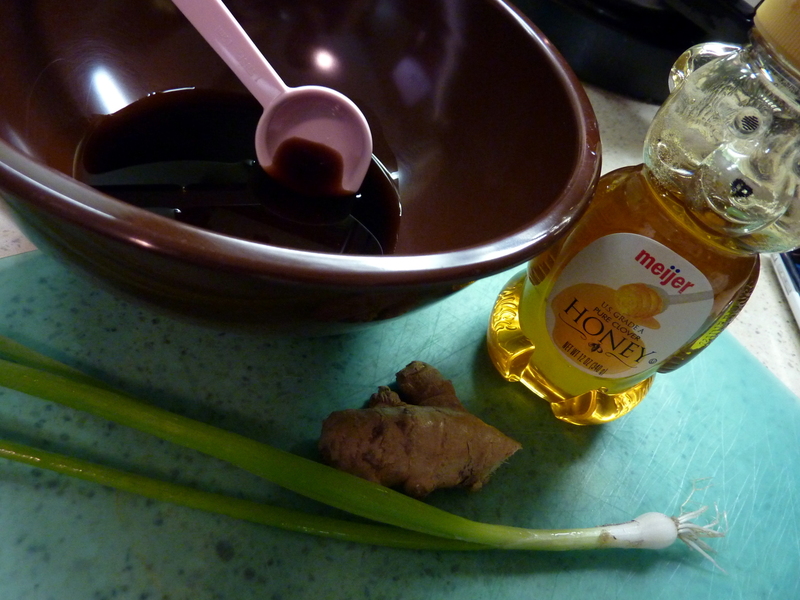 And remember the honey-ginger soy marinade? Here is the finished product. 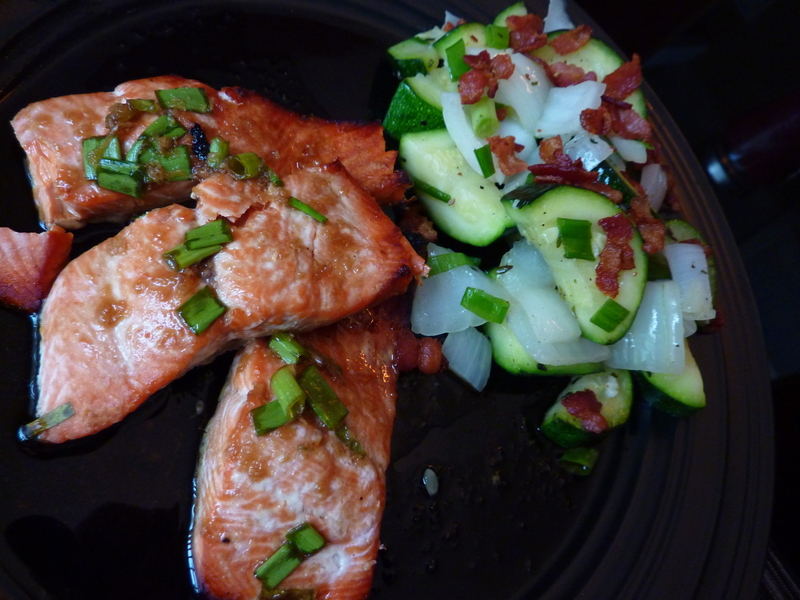 Honey-ginger soy salmon. See how everything is red and green!? Super delicious dinner! 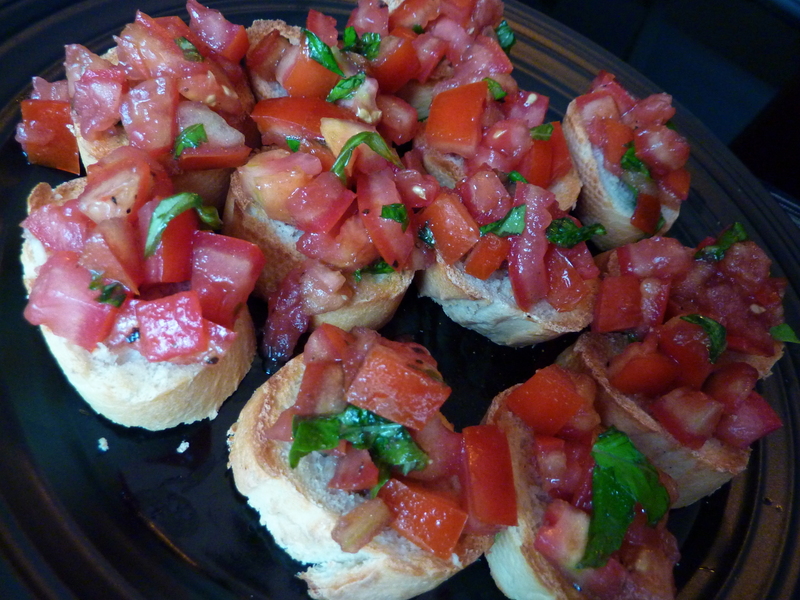 My favorite was the bruschetta and I can barely wait to make it again this week. 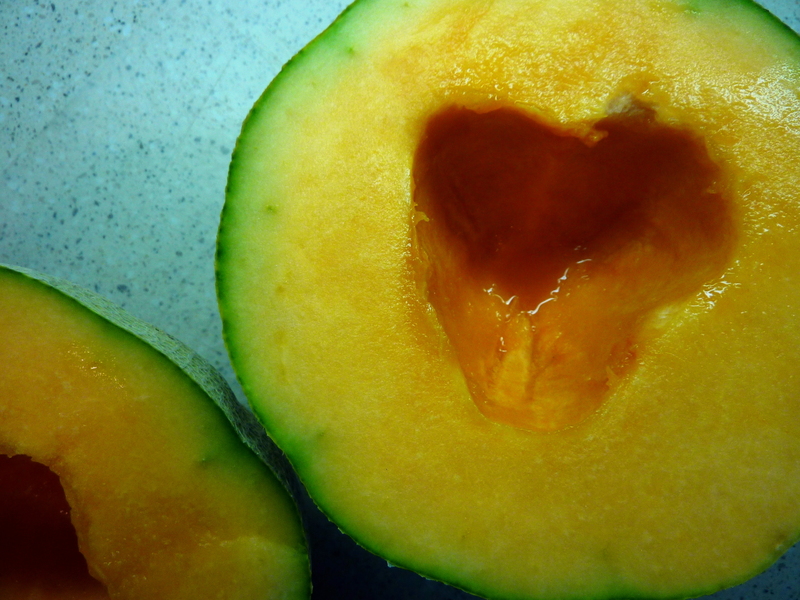 ♪♫ Currently listening to: Jar of Hearts – Christina Perri.